Quite fitting that on the first day of class, I am writing about my summer vacation. Although technically, since UP adjusted its academic calendar, "summer" now meant late July, and the kids nowadays call it "midyear break." But whatever. The sun was out and I was on a beach two weekends ago - sounds like summer to me! True to last year's word, our high school barkada once again surprised ourselves by actually pushing through with a great escapade - and this time, by plane! I think it needs emphasizing that we are such losers when it comes to planning any get-togethers. For the longest time, we've failed miserably at the idea of "going out" and "getting away. Almost always we just ended up at someone else's house to hang out, watch movies, talk about people, and fall asleep. But thanks to the success of last year's spontaneous Borawan trip, we've gained enough momentum to finally push through with this one. After all, we've gone outside Metro Manila, finally - why not leave Luzon altogether? 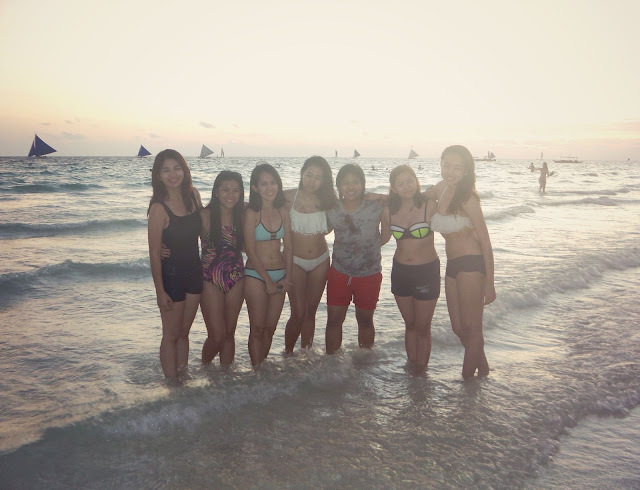 And so, Boracay it was. Yep, the cliched, uninspired, obvious choice for a summer getaway. But everybody flocks there for a reason. And when the opportunity to go there presents itself, you do not say no. And how can you? With its pristine white shores and deep teal waters, it would be a travesty to refuse. Oh, Boracay. How do I even begin to explain Boracay? It's like meeting the popular girl, and realizing why everyone is in love with her. Just like last year, we brought our plus-ones along. And again, like last year, it was nice to welcome new faces into the fold. There's a special kind of gladness that comes with hanging out with the girls I love, and the people who love them. And it's really great to see everyone getting along quite perfectly. It's comforting to know that the most important relationships in our lives - closest girl friends and significant others - are not mutually exclusive, and can, in fact, co-exist happily and hilariously. First time to explore the beach the next morning! Since we were pressed for time (because of the flight delays the previous evening), we just opted for the activities that everyone really wanted to do. Almost everyone was a first-timer (I think only 4 of us had been there before), so we wanted the best slice of the typical Boracay turista pie in the shortest amount of time. It was actually quite easy to haggle since there were 12 of us! So we ended up parasailing, getting thrown off of the flyfish, and riding ATVs. While ascending on the parasail! Relationship milestone: check! Still amazed at the wide-angle shots! (although it did have a wrist strap), this was the best selfie we could get. Look at that sky! So blue! The following morning, we went to Puka Beach, which was a P25 tricycle ride away from the main strip. And wow, I thought the main Boracay shoreline was beautiful, but I was definitely floored! It was the most exquisite beach I have ever seen. The water was so clear, the sand was so white, and everything just looked like it came straight out of a postcard. Since Puka Beach was a "virgin" or untouched beach, there wasn't a lot to be done on that side of the island. But they did have paddleboards and kayaks for rent. Of course, Louie and I gamely tried it (after much haggling by Joa and Louie)! We tried the clear kayak, which was for two people. It was so cool! I felt like we were in the Amazing Race; I kept pretending we were rushing to the next pitstop the entire time :)) The waters were soooo blue, I had goosebumps at seeing how clear and deep the sea was just right below us. I actually took a video of our kayak ride. I placed the Re on my chest, tucked inside my vest! How handy! But when I checked the video, apparently I had some strands of hair covering the lens :))) I'll probably just crop that part out so that I can upload and share the video. The view was fantastic! The weekend may have been extremely short, but it turned out to be just the kind of last-minute summer escapade I needed right before school started. 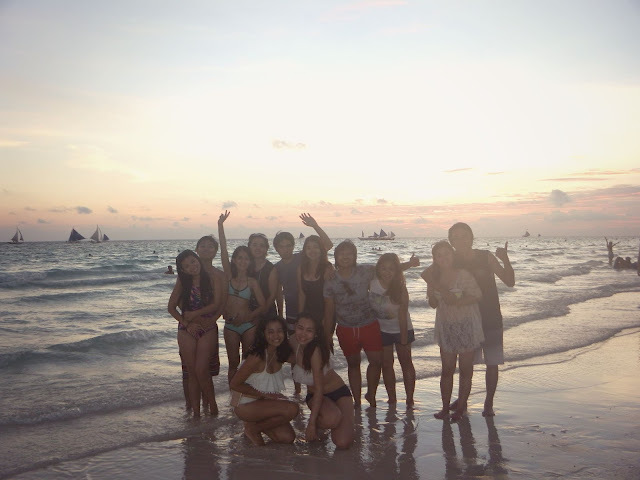 There really is nothing quite like a trip with my high school barkada. The jokes, the games, the harmless kulitans - it's all part of our histories that have not changed at all, and I am always grateful for that. When we're all back together, we're just our usual 16-year-old selves again, laughing at the littlest things and making fun of each other's quirks. It's the kind of familiarity that makes you feel that all is right in the world - for everything else that has changed, these guys are my constant. The "joke" now is, since last year we went to Borawan, and this year we went to Boracay, next year's stop should be Palawan. Everyone's psyched to go to Coron, and even though I just went last January, I'm already super excited to return! Crossing our fingers that that one pushes through! And I think it will, considering how much fun we had last year and this year. There's already momentum keeping the ball rolling and really pushing us to plan in advance for the next one. Here's to hoping all our schedules match and everything falls into their places by then. Until then, Boracay, you'll be on our minds!